Back by popular demand, this Solos ski holiday invites you once more to Switzerland where you can explore the snowy-white Alpine landscape of Adelboden in the Bernese Oberland, one of Switzerland's top ski resorts. With its attractive ski areas and variety of pistes, Adelboden is a spectacular winter arena and, not surprisingly, one of Switzerland’s top ski resorts. 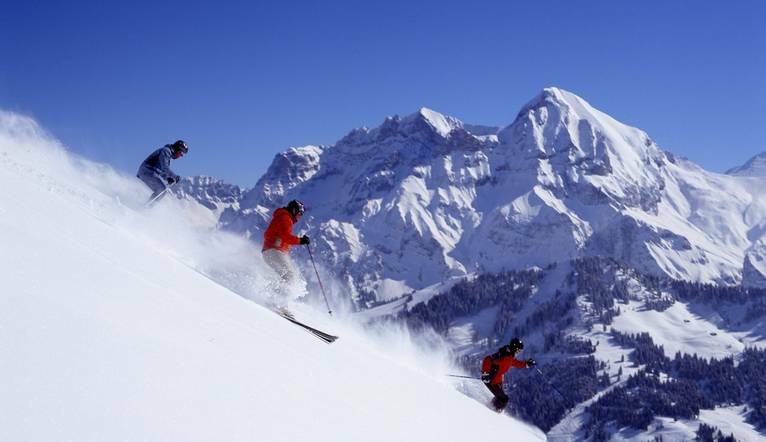 The main ski area lies between the villages of Adelboden and Lenk, where 185km of piste offer a wide range of slopes, especially for beginner and intermediate skiers. At the end of each day, we can either jump back on the cable car or follow various reds and blues that lead us down the valley, through a forest of majestic pine trees. Adelboden itself is a traditional and tranquil Swiss mountain village. Evenings are informal and based around the few restaurants and bars in the resort. If time off the skis calls, this is also a great spot for other winter pursuits such as tobogganing and ice skating. The different areas offer a good choice of downhill skiing, cross-country skiing and well prepared pistes set in mountain scenery. A first-class network of lifts transports us to gentle blue runs, medium-difficulty wide carving pistes, interesting snowboard parks and the World Cup piste at Chuenisbergli. This extremely challenging black run is now a classic venue for the FIS World Cup series. Over 60 of the main pistes are supported with artificial snow-making facilities so there is guaranteed skiing offered throughout the season. Another bonus is that the slopes here, unlike other well-known resorts are never overcrowded. Of course, there are plenty of Swiss mountain bars and restaurants here where we can take in the view and recount our morning exploits! Excellent trip, fantastic Tour Leader, great hotel and a great group. Would definitely recommend this holiday! Lovely, friendly, family-run hotel. Excellent food. Easy access to slopes and great skiing. Popular with new and regular guests, our hotel is within a 5 minute walk of the village centre of Adelboden and just a 3 minute walk to the Silleren cable car. Family run and very welcoming, there are 2 linked buildings and facilities include a restaurant serving sophisticated cuisine, a bar/lounge, games room, as well as a relaxation 'oasis' with sauna and steam bath. The comfortable guest rooms have a shower, satellite TV, a telephone, safe, hairdryer and Wi-Fi. It is your responsibility to ensure that you are physically fit and in good health, so that you can take part in your chosen Ski holiday. The transfer from Geneva airport to the hotel is approximately 2.5hours, depending on weather and traffic. The transfer from Basel airport to the hotel is approximately 2 hours, depending on weather and traffic. During the course of your stay, you will have the opportunity to take some optional excursions. Your Tour Leader will give full details of all the trips available to you at your Information Meeting. Your Tour Leader will help arrange these for you but may not necessarily accompany you. We have listed below the most popular tours. Prices are approximate, per person and subject to availability and size of group. Tobogganing Price: to be advised in resort. Ice Skating Price: to be advised in resort. Snow-shoeing Price: to be advised in resort. We suggest a Group Collection to cover transfer drivers, and hotel staff of CHF20.00 per person. Your Tour Leader will collect this on your behalf and distribute it accordingly, thus relieving you of the burden of who, when and how much to tip. The tipping of housekeeping will be left to your individual discretion (a small amount left in your room on departure should cover this and would be much appreciated). As is customary, ‘the hat’ will be passed around for the driver and guide on all optional excursions. For any meals that are not included in your itinerary, or taxi fares, your Tour Leader can advise of an appropriate Ͽo add on. If you choose to have ski lessons, you may also like to thank your ski instructor at the end of the week with a token of appreciation.